I concluded Science, science fiction, and fantasy among the 2017 Grammy nominees with an aside that served as a program note. Speaking of the Critics' Choice Documentary Awards, "An Inconvenient Sequel: Truth to Power" earned three nominations, as did "Chasing Coral," the sequel to "Chasing Ice," so I might just write about them in a future entry. Stay tuned. 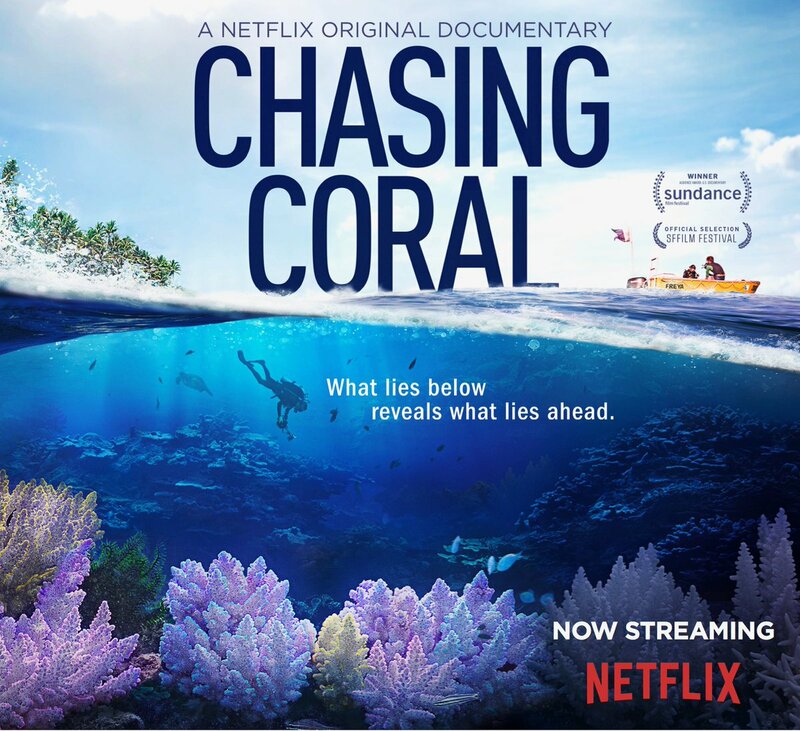 My students have been telling me about "Chasing Coral" all semester and I have been telling them they can watch it and write a report for extra credit, so I think it's time I write about it here. While the critics like it enough to nominate the film, the audiences seem to love it. Two of its wins are audience choice awards at the Sundance Film Festival and the Boulder International Film Festival. At the latter, it also won Best Feature Documentary and Call to Action Award. That gives me added confidence in recommending it to my students. Enough of the film's critical and popular reception. It's time to watch its Official Trailer from Netflix. That certainly does the job a trailer should do, make one want to watch the movie, but it doesn't say enough about the findings and their significance. PBS NewsHour has those in ‘Chasing Coral’ documents destruction of coral reefs. In the new documentary “Chasing Coral,” a team of photographers, divers and scientists analyze more than 650 hours of underwater footage to illustrate the real-time effects warming seas. NewsHour Weekend’s Saskia De Melker talks to Jeff Orlowski, the director of the film, about the challenges of showing these rarely-seen effects of climate change. I agree with Orlowski; that climate change has become politicized is "massively unfortunate for human civilization" (hi, fellow Crazy Eddie!) and it needs to be depoliticized to solve the problem. Also, I was pleased to learn that "Chasing Ice" won Outstanding Nature Programming at the News and Documentary Emmy Awards in 2014. I've been telling my students about its Oscar nomination for Best Achievement in Music Written for Motion Pictures, Original Song for years. Now I can tell them it's an Emmy Award winner, too. I expect I'll be able to tell my students about "Chasing Coral" earning an Emmy nomination for Outstanding Nature Documentary next summer and its likely win in the fall. I'm looking forward to that. Speaking of Best Achievement in Music Written for Motion Pictures, Original Song, here is Tell Me How Long Music Video Feat. Kristen Bell from Netflix. Kristen Bell performs "Tell Me How Long" from the new film Chasing Coral, now streaming on Netflix. That's a very appealing song about an appalling subject. Because of that, I hope it earns an nomination for an Oscar. If it's eligible for a Primetime Emmy for Outstanding Original Music and Lyrics, I hope it's nominated for that, too. After all, Common pulled that off for “The Letter to the Free” from "13th," which was also in a feature film. And, yes, a work can be nominated for both the Primetime Emmys and the News and Documentary Emmys. "Wild New Zealand" managed to pull that off, being nominated for both Outstanding Narrator at the Primetime Emmys and Outstanding Nature Documentary the News and Documentary Emmy Awards. I hope Netflix submits "Chasing Coral" to both awards programs. It deserves the recognition. *Much to my surprise, I've never mentioned Jane Goodall before at this blog, even though she's a scientist, and environmentalist, and a celebrity. That's a combination that should have attracted my attention years ago. Also, I discovered the Environmental Media Awards, USA during my research. This is an event I should have known about already as well. I plan on writing about them, too. Stay tuned.